Rescue dog suspect in the case of 24 missing meatballs! The blurb is true – trust me, I might be a fiction writer but I could not make this stuff up. I wrote the following story shortly after Cooper came to live with us and it was published by Happy Tails Books in LOST SOULS: FOUND! Inspiring Stories About Labrador Retrievers. If you have lost a pet or are simply a lover of animals, I think you will relate to this story. Molly had come to us as a pup just a year after my husband and I blended our families, and she’d often been lovingly referred to as ‘our baby.’ Her passing at age 12 gave us several tough months. We all grieved in our own way. My husband missed Molly and said if it were up to him, he’d be done with pets. To this I replied, “I want another dog…just not yet.” My youngest came home from school every day with different websites for rescue dogs. She found several, including one “Lab” named Cooper that I said didn’t look like a Lab. I wandered through the days, eventually picking up Molly’s bed and putting away her bowls. It took months for me to be able to talk about her without crying. 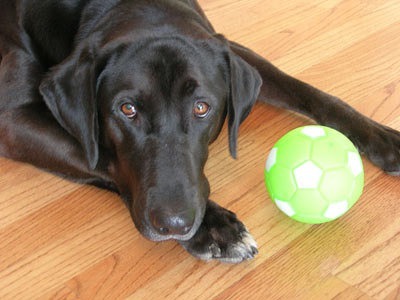 Our decision to rescue a Labrador Retriever was a good one, but the method we used was not. Again, my daughter came home from school insisting she had seen a dog on a website who should be rescued immediately. “It’s an emergency,” she said. I agreed to look. Yes, the dog was pretty. Yes, she looked sad, and with her hefty size she wouldn’t be the first on someone’s adoption list. After a few days of thought, we decided to give this one a try. The dog loved us, loved her long walks, and loved the special attention she received. Unfortunately, she didn’t like other dogs and attacked two in our neighborhood. Sadly, we gave her back to the rescue organization, a hard decision but the right one. So there we were, holding out our hearts, only to have them crushed. Weeks passed and my youngest started with the websites again. I was determined to be smart about it this time. Emotion would not carry me away. I contacted a local breeder who happened to be one of the founders of a local rescue group and inquired about a few dogs on their site. I described our recent attempt at dog rescue and stated I was looking for a girl, but when my contact said she’d evaluated a smart, impressive male she thought might fit us, I became interested. After family discussions and a call to his foster mother, my husband and I decided to meet Cooper, the dog my daughter had shown me weeks ago that I’d said didn’t look like a Lab! Pictures didn’t do him justice—of course Cooper looked like a Lab, but he looked like something else, too. He had long legs, wide foot pads, and a nose like a Pointer. And he was so thin! His ribs showed through his shiny coat and there were fly bite marks behind his ears. Cooper met us along with his foster brother but was more interested in playing ball and running around than checking us out. He definitely was a high-energy dog, certainly a change from Molly and her senior citizen days, and according to his foster mom he had some medical issues. Still, we decided to take him. He came home on a trial that I prayed would become permanent. Cooper’s personality emerged and his medical issues improved. He wanted to be near us—to play, run, retrieve—do what two-year-old dogs do. He exhausted me at first; I was used to a twelve-year-old dog. Cooper expected three-mile daily walks regardless of weather and proved to be the best exercise buddy I’d ever had. We continued to challenge Cooper, practicing his tricks, reinforcing what his foster mother taught him, adding a few more to his routine, and putting him through dog obedience school. It was an adjustment to have a young dog in the house, and not just the energy level! My mother, a wonderful if not continuous cook, was visiting shortly after Cooper’s arrival. She’d taken 24 meatballs from the freezer and placed them in a large Pyrex baking dish by the stove. We ran to the store and when we returned, the meatballs were gone, but the Pyrex dish hadn’t moved an inch! Several months later my mother visited again, this time with a baked a ham. Again we had to go out, so I put the ham in the laundry room on top of the dryer. It was in the same Pyrex dish the meatballs had been in. Of course, I forgot to close the laundry room door, so when we returned, we found the ham in the family room with the dish on top of it! How did Cooper get the Pyrex down without breaking the glass? Why were there only a few splatter marks on the walls? Why wasn’t the floor covered in grease? Only Cooper knows for sure and he’s not telling! Cooper has been an incredible gift. He’s taught us the beauty of second (or third) chances and opening up to love again. He isn’t Molly. He’s Cooper, and boy, do we love him!